Now who will assess the power of Trump’s genes? President Trump has a knack for ruining the reputation of everyone he comes into contact with, but there’s an unusual twist to the Ronny Jackson debacle: Trump will experience some consequences too (or at least an inconvenience). 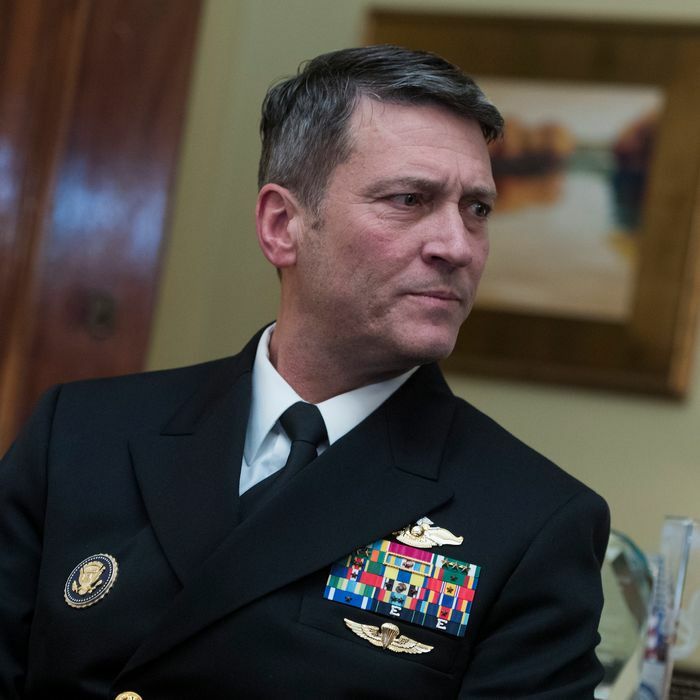 Two senior administration officials tell Politico that Jackson will not return to his role as the president’s personal physician in light of allegations that led to his withdrawing his nomination to lead the Department of Veterans Affairs. It’s not all that surprising that someone accused of drunkenly wrecking a government vehicle, drinking on the job, freely dispensing prescription drugs, and creating a hostile workplace environment would no longer be allowed access to the president. Sean Conley, a Navy officer who took over Jackson’s responsibilities after his nomination last month, will continue in his role as Trump’s physician. The Washington Post said that Jackson will remain on the staff of the White House medical unit, but the New York Times reported that it was unclear if he would remain on staff or retire from the military. Jackson has denied the allegations (which likely would have come up prior to the nomination if Trump had given staffers enough time to properly vet him). The White House said last week that it found no evidence to support the claim that he wrecked a government vehicle, and the Secret Service denied the report that agents had to intervene when Jackson drunkenly pounded on another official’s hotel room door during a trip with President Obama. Trump called for the resignation of Senator Jon Tester, the ranking Democrat on the Veterans’ Affairs Committee, though he said he merely released a summary of allegations from more than 20 people. Both Tester and the committee’s Republican chairman, Senator Johnny Isakson, signed a letter demanding that the claims against Jackson be investigated. President Trump recommended Jackson for promotion to two-star admiral in March, and now that’s in question as well. At least two members of the Senate Armed Services Committee, which approves promotions for senior military officers, have called for the Defense Department to look into the claims against Jackson. “The information that was brought to the attention of the Veterans Affairs Committee must be reviewed and addressed by the Department of Defense before the Armed Services Committee can consider the nomination,” said Chip Unruh, spokesman for Senator Jack Reed, the ranking Democrat on the Armed Services Committee. Even if Jackson does not face further career consequences, expect the next update on Trump’s health to be considerably less colorful.